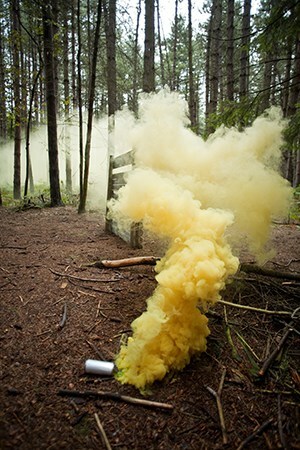 Looking for paintballing in Nottingham? Fancy yourself as a bit of a Robin Hood? Then read on! Widely recognised as the home to the infamous Robin Hood, Nottingham offers its visitors plenty of stunning scenery. Known as an adventurous city with plenty of outdoor activities to choose from, it makes an ideal environment for Delta Force Paintball Nottingham. With several state-of-the-art game zones to choose from, all set in dense woodland, it’s a Robin Hood’s dream! Set in a gorgeous forested area, the Nottingham’s paintball centre sits so close to the M1 motorway, it might as well be on it! And with its own private access just metres away from Junction 24, it makes a super convenient location. There’s no way you’ll get lost on your way to Delta Force Paintball Nottingham! Delta Force Paintball Nottingham lives up to its region’s adventurous reputation by offering paintball enthusiasts a day out they’ll never forget. With a wide selection of movie-like game scenarios including The Haunted Graveyard with it’s scary looking church and gravestones for players to hide behind, Viet Cong Village showcasing several abandoned village huts and old chapel and Tomb Raider which features a giant pyramid and mummy statues – ideal for all those team photographs, there really is something here for everyone. 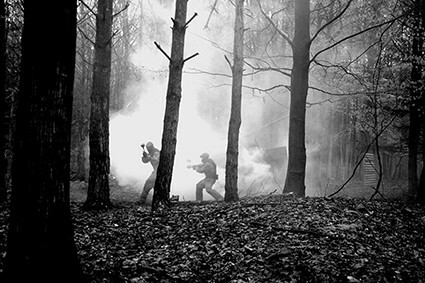 Pyrotechnics (such as MK5 Thunderflashes, smoke grenades and paint grenades) can also be used to make your game scenario feel even more realistic! Cool eh? The facilities at the Nottingham paintball centre are first class: we provide proper flushing toilets on mains water (so no unpleasant portalools), both covered and open picnic areas with plenty of seating within the base camp, hot pizza lunches (provided by an off-site catering company), complete safety protection gear (including full head helmets with anti-fog lenses, padded body armour and combat suits) and first rate equipment, such as our high spec paintball guns and ammunition. Delta Force Paintball has even been awarded a five star rating for outstanding Health & Safety standards by the sport’s governing body, The UK Paintball Association (UKPBA). So, you can relax in the knowledge that you and your friends will be properly looked after during your time with us.